Hello Nosh Show listeners! Episode 87 is alive and well and hoping you'll give it a listen. 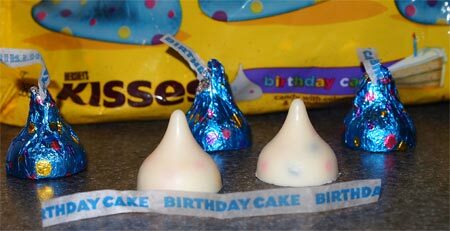 We recap several new products including Hersheys' Birthday Cake Kisses. Now I don't think I've enjoy a plain Hershey's kiss since the 80s. I'd get them in my halloween pail and be like UGGG. I know peanut butter cookies with a hershey's kiss on top are a staple to many, but that just wasn't one of the many cookies we made in my house. Basically I just avoided eating plain Hershey's kisses unless I was crazy hungry and someone left a container of them out at work. I wouldn't grab a bunch, just one or two to remind myself that I just wasn't much of a fan. There's just something about the plain milk chocolate flavoring that either never worked on me or I just grew tired of after awhile. Now this isn't to say I never eat any Hershey's kisses. I recently discovered special dark chocolate kisses and I have become quite a fan. I like the fact that I can have two or three or four or five to get just the right amount of dark chocolate in me to satisfy any cravings that I am having. 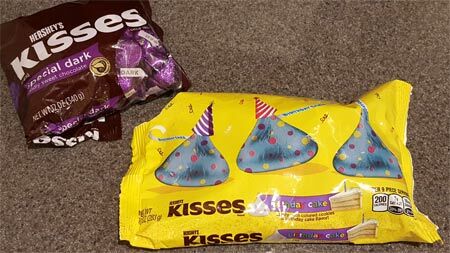 At first I was skeptical of the birthday cake kisses when we talked about them on Episode 86, but as we dug in to specifics more, I wondered if they might really be a winner like Hershey's little Cookies & Cream nuggets. Well, on this episode Eric confirms they are tasty and then on sunday night we spied a bunch of bags of these as we passed the birthday section in Walmart. That's right, they are in the birthday section with the other birthday wrapped candies. I've tried them several times and I definitely like them. They with definitely remind you of the C&C nuggets, but they do taste like cake as well. Whereas I think the boo-tterscotch M&M's flavor didn't match the texture, it's not the same here. We're all used to the certain texture you get from cake and frosting and that is partially recreated with the white confectionary stuff here. And if you want to get a little crazy, these will melt pretty quick on your tastebuds. I was having so much fun that I even started mixing the special dark kisses with the The only caveat is I don't know if I could (or should) eat a ton of these in one sitting. They are so flavorful that you really only need a couple to get a quick sugary fix. So, try these if you need a potent sugar fix and then have yourself a good week everyone. I don't know the official name for them, but these kisses make me think they might taste like those colorful candies in the shape of kisses...I think they are often used as party favors and come in blue, yellow, pink, and green and have some of those white spots on them like the snocaps/nonpareils.